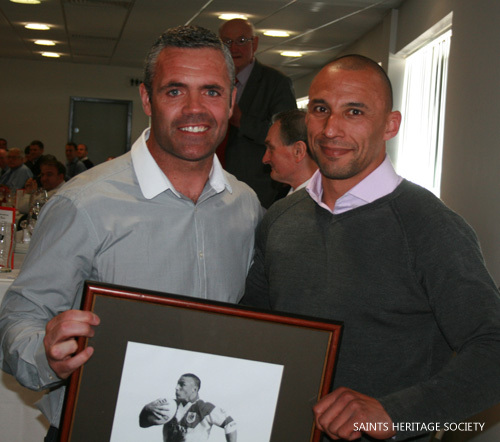 Anthony Sullivan was inducted into the Saints’ Players Association Hall of Fame at the 34th Annual Luncheon on Sunday 2nd June. The flying winger, who represented Saints [over 300 appearances and 213 tries], Wales and Great Britain with distinction in his ten-year career was delighted and extremely proud to receive this prestigious award. He becomes the 50th person to enter into the Hall of Fame, which also includes fellow team-mates Bernard Dwyer, Paul Newlove, Chris Joynt and Tommy Martyn, who presented him with his award. The Dinner at Langtree attracted almost 300 people – a record in itself!